There are two ways to share folders on Paubox. We'll show you how to share folders by requiring users to login. If you would like to share a file or folder via encrypted links, click here. Only authorized users can access the shared folder. You can set permissions for each user (upload and download vs. download only). You can stop sharing a folder with someone at any time. Receive email notification when someone you've shared a folder with uploads something into your shared folder. Automatically generate email alerts to those you've already shared a folder with if you upload more content. Each email notification option can be enabled/disabled in Settings. 256-bit AES encryption during transmission (in motion). We store your data in an encrypted state using 256-bit AES encryption (at rest). This method is a HIPAA best practice. Next, click the dropdown arrow associated with the folder and choose Share. On the next screen, enter the email address(es) of those you want to share the folder with. 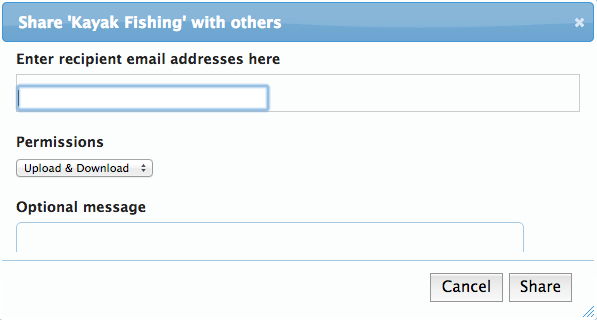 You can separate email addresses with either a space, a comma, or a semi-colon. Click Share to finish the process. After you click Share, each person you’ve shared the folder with will get an email notification to pickup the folder. It will look similar to the image below. Clicking either Click here to view or the blue View Folder button will take them to a sign in page for Paubox. If they don’t have already a Paubox account, creating one is free. Once they’ve picked up your folder, you’ll get an email alert. Does Paubox work with JAWS (screen reader)?